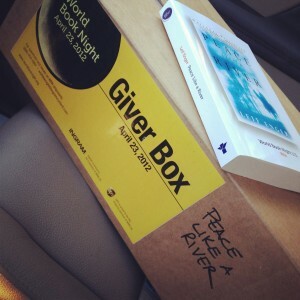 Today is World Book Night 2012, and I am one of 25,000 “givers” who will personally distribute half a million free books today. As part of the campaign to change lives through literacy, volunteers will be sharing copies of their favorite books at VA hospitals, nursing homes, ball parks, mass transit, diners and other places where would-be readers are underserved. 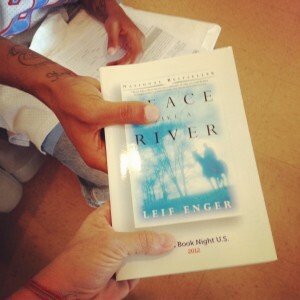 To give away twenty copies of PEACE LIKE A RIVER by Leif Enger, I chose the Covenant House, a shelter for homeless, throwaway and runaway teens. I introduced myself to a staff member, and told her why I was there. “Do you think there are any residents here that would like to have a copy of this book?” I asked. In the adjacent lunchroom, two dozen or so teenagers—many of them scarred, tattooed, broken-looking—talked and ate in small groups. Rose announced me and my intentions, and the kids looked at me somewhat suspiciously. As I told them why I loved this incredible story of a young boy’s journey across the frozen Badlands of the Dakotas in search of his fugitive older brother, it occurred to me that I might not be able to give away any books at all. “And me.” They came one by one, and I pressed a brand-new copy into each of their hands. To a one, they thanked me with such sincerity I didn’t think I could bear it. He bent down to my ear so that he could whisper it aloud, even though I could read along with him. It was filled with spelling mistakes and grammar errors and despair and pain and beauty and also hope, because he’s still alive. “This was going to be my suicide note. But I decided to make it into a poem instead.” I wish I could post it for you to read, but I promised him I would keep it private. I looked around the room at these drug users and abuse victims—these beautiful souls with their own stories whose lives were changed by their circumstances. I told them that I would come back in a month, and we could have a discussion of the book. They were all so unexpectedly enthusiastic about the idea of a Covenant House book club, even though some of them will have moved on by then. By discovering the freedom and self-reliance and majesty and bravery within this book, perhaps these kids will be better able to find it within themselves. World Book Night is about hoping that through an introduction to the love of reading, people can change their lives for the better. And I think that because of today and Voltaire and the other eager, grateful receivers of the books that I was able to share, that my life may be forever changed, too. Oh, you are a beautiful soul. Thank you for sharing. This belongs on the World Book Night website. Thank you for sharing your magnificent experience with us. This is what World Book Night is all about. A wonderful story. to senior apartments and Concordia nurses to give to shut ins. It made me very happy..
You described a moment so beautiful that I am reminded again how lucky I am to not only have books, but people with whom I can share them and my life. Thank you. Thank you so much for sharing this experience, for sharing this gorgeous, bittersweet, pain-full, hope-full time with us. THIS is exactly why World Book Night exists. I had the privilege of giving away Peace Like A River today at the high school where I work. Chris, this is so moving. I can imagine how you felt after doing something so right. Whew — tears in my eyes! You did a lovely thing. Books change — and save — lives. Thanks for sharing your story. This is what this day/night is all about! And thank you to World Book Night for giving us this amazing opportunity! This is amazing. Thank you so much for sharing your experience. My day as a giver was more lighthearted today, but still enjoyable. I’m just blown away by the emotion in this, though. Thank you. Just, thank you. Lovely story. It just goes to show, you really can’t judge a book by its cover. That’s all any of us are really. Stories in different jackets. Thank you. what a wonderful story!!!!!! ..I am in Pollock Pines California, in a small town (in the woods)– I am just taking my time, talking with people-and having a blast!!!! Went to the hair salon, Senior Lunch at the community center. Walked around parking lots-found a young mother in the market-another young parent at the burger place, and two young parents walking their children down the main road here (I am finding young parents very receptive 🙂 still 10 to go…my friend and I split our books. I have…Because of Winn Dixie and My Sisters Keeper…great books–great fun. Hope and potential. In a book. Absolutely stunning and amazing. I am blown away. If I am so fortunate as to ever have the opportunity to participate in this program, I can certainly tell you where I will be distributing my books. Thank you. I found you blog through Zite. This post is the surprise of my day. You did an amazing thing, opening worlds and futures to those that need it the most. I mediately added your blog to my feed reader. I gave out The Things They Carried on skid row in down town LA. All 20 copies in a heartbeat. Wish I’d had more. Isn’t this a fabulous event???? This is what World Book Night is all about. I have tears in my eyes after reading your post. Holy cow… you made me cry. That is an incredible experience. I have a link on my blog for people to link up there stories of World Book Night, I would be honored if you would add yours. Your post is not to be missed. “Sometimes we need books. And sometimes books need us.” A beautifully written story about the power of human connection…..
Love, love, love. Will check back in a month. Thank you for sharing. Powerful. What an inspiring story. It made me cry. World book day is truly a brilliant thing! Smashes anything I’ve ever written into the ground. You got yourself a new fan. Thank you for sharing this story. The power of words. You never know what secrets another person might be holding onto, especially those hidden in their back pocket. Awesome! What a difference you and World Book Night USA have made! I was a giver too and just loved giving the books away to readers. A night to remember. Thanks for sharing your experience. Well done. What an awesome story! You touched so many peoples lives with the gift of a book. I love the idea of a book club there. Maybe you can get authors to donate books for the occasion. I’ll be joining this next year, I just heard about it. Thank you all for your beautiful comments. I’m excited to share that we’ve confirmed May 16 for the inaugural Covenant House book club meeting to discuss PEACE LIKE A RIVER. What an amazing turn of events. World Book Night seems like it has reached so many people and has deeply affected many of them. I know I enjoyed giving Junot Diaz’s The Brief Wondrous Life of Oscar Wao and seeing the curiosity and delight on the faces of those who received a copy. I wish you the best of luck with the book club and hope that Voltaire and all the others at Covenant find something to connect with in Peace Like a River. What a powerful story, Chris. I know the book club will be a success. I hope you will write a post about it after it happens. Thank you for sharing your story. Thank you for sharing the world of books to these kids who were so desperate for this. It’s tough to work with that kind of population. They are so hurt by people and needing so much. Thank you for giving some healing to them by just being there, to listen and to care and to be interested and to be thinking of them, to give them something of their own. wall so others would understand the power of a book. Thank you for sharing your story- and for being a bright star in the life of those kids. An amazing, heart-warming and sincere article. I have reblogged this on my blog, the link is http://keyfyapmak.tumblr.com. Are you only based in America? And do you do any work in the UK? Oh my, Chris… I’m humbled by your beautiful story. Covenant House was such a great place to choose to give out a book. And going back to discuss the book is an inspired and wonderfully giving idea. It certainly sounds like you touched many of the teens at Covenant House. Voltaire’s story brings tears to my eyes. I hope he continues to write and read. Thank you for sharing your story, I did want to cry. I was a giver also and I am so touched by your experience. Thank you for the reminder of how sweetly and deeply words can touch the heart. I loved peace like a river- a gripping story. Beautiful stories you have to tell, sweet Chris. I’m stunned, awed, and humbled by this. Thanks for sharing it. I’m going to try and do something similar next year. That brought tears to my eyes. You should make this a personal essay. I could see the boy through your words. You’ve touched people, remember that. This is a beautiful post. Did you go back? I should not have read this at work. Now I am sitting at my desk trying to hold back tears. I hope my experience this year will be great, though it will be tough to match such an incredible day as this. Such a beautiful story and a beautiful gift you gave those teens. Voltaire’s story is so special. I am reminded of a Zen saying “sometimes even in the driest hole you can find water”. Very moved.